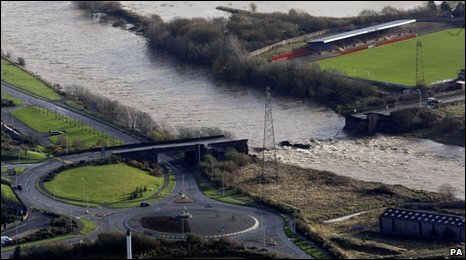 A "significant number" of firms have put in bids to build a temporary road bridge in the flood-hit Cumbrian town of Workington, council bosses say. The town was effectively split in half in November when unprecedented water levels destroyed Northside Bridge and badly damaged nearby Calva Bridge. An Army-built footbridge, named after a policeman who was swept to his death, was opened in December. Cumbria County Council said the road bridge may be complete by late spring. At the moment, Workington motorists must cross the River Derwent at Cockermouth's Papcastle Bridge - a detour of about 18 miles (30km). The authority said the exact number of contractors expressing an interest could not be revealed for legal reasons while the procurement process was ongoing. But a spokesman said there had been "genuine interest" in the project from major contractors. The preferred site for the temporary bridge is east of Northside bridge and connecting to the A597. It is likely to be a two-lane bridge capable of taking lorries up to 44-tonnes. Cumbria County Council leader Jim Buchanan said: "We're doing everything in our power to get this bridge built so Workington is reconnected by road as soon as possible. "We're well aware of the disruption and inconvenience local people and businesses are dealing with while there is no road bridge." Transport Minister Sadiq Khan added: "The government has pledged to give Cumbria County Council the funds it needs to build temporary bridges and to help the area recover from the devastation of last year's flooding. "We have already funded a temporary footbridge over the Derwent and provided additional investment for train services and I am delighted that the construction of this new bridge is now taking a step forward."